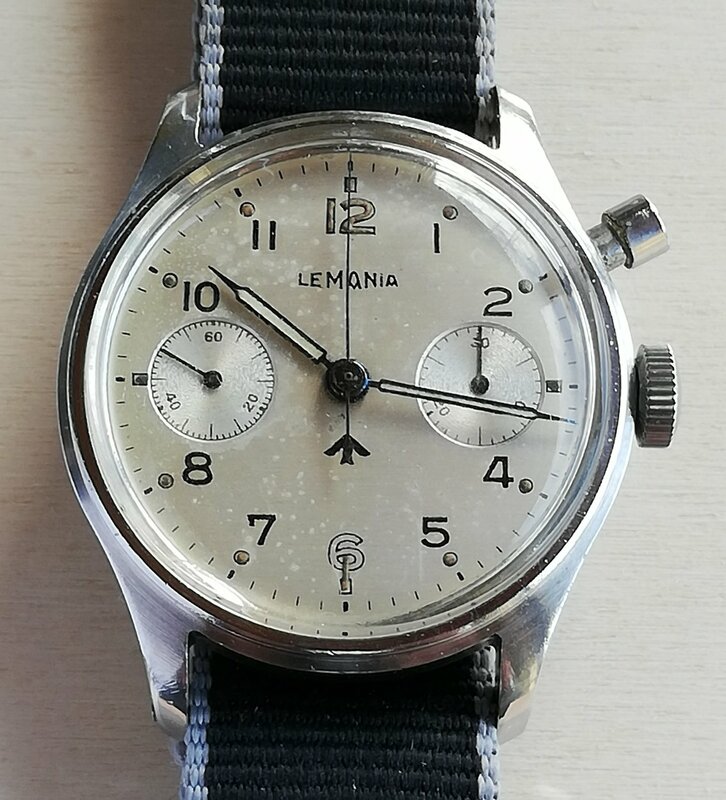 Stainless steel Lemania pilot's chronograph wrist watch specially produced for the the Royal Fleet Arm (Navy Airforce) and normally only issued to their navigators. Heavy stainless steel case with screw-on back. Fixed strap bars. Chronograph button mounted on side of case at 2 o'clock position (starts, stops and resets chronograph function). Back of case engraved with the British War Department arrow, the Royal Navy mark "H.S.9" ("Hydrographic Service 9" - Royal Navy's code for chronograph wrist watch - used between 1939 & 1946) and serial number "6536". This watch shows a short service life, as most of these would have ended up being double struck, but this retains it’s sole HS9 number. Original dial with black numerals, wonderful patina due to it’s age. No „T“-dial, means,that this watch escaped the wholesale redialing of these timepieces which took place around the early to mid 1960s when all radium dials were replaced or reprinted to have the less radioactive 'tritium' luminous compound. Case width (not including crown or chrono. button) : 38.5mm. Good quality, gilt, 17 jewel chronograph movement. signed, Lemania calibre 15CHT. Watch comes with a black Nato strap – if you prefer a handmade vintage Nato-strap add 60.- Euro.